The Amazon rainforest in South America is a veritable melting pot of all things insect, from the magnificence of a butterfly to the most terrifying of multi-legged creepy crawlers. Home to more than 30 million types of insects, the Amazon provides a habitat to those who fly, spin an intricate web or blend almost invisibly into their surroundings. Ninety percent of the insects alive today in the Amazon rainforest are arthropods, including spiders, of which 3,600 species are known to make their home in this South American jungle. These spiders range from nearly microscopically tiny to those larger than a human hand. 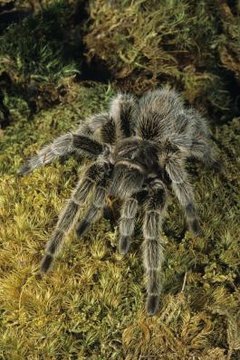 Specifically, the Amazon is home to one of the largest known spiders, the Amazonian tarantula, which can reach a terrifying size of 13 inches across. Equally frightening is the Brazilian wandering spider, also known as a banana spider, which is one of the most venomous spiders in existence. An untreated bite from a banana spider can kill a human being in as little as 25 minutes. Far less intimidating are the glorious winged insects who flit along the humid breezes of the Amazon. Despite their ability to take flight and flee from predators, these butterflies, of which hundreds of species are known to make their home in the rainforest, employ a variety of tactics to steer clear of danger. The enormous Caligo owl butterfly has feathery wings spotted with a false "eye," which is enough to deter any predatory bird. The Taygetis angulosa has the appearance of dead leaves and can easily camouflage itself into surrounding foliage. Much more difficult to miss are the swallowtails, and the magnificent blue doctor, whose blue wings rival the skies of the clearest day. Similar to the butterfly, with its emergence from a larvae encasement, is the cicada, and along with crickets, these insects create the music of the night in the Amazonian rainforest. The sound begins as a gentle clicking sound and reaches a greater intensity to sound like the hum of an engine. Equally as musical are the species of grasshoppers, including the long-horned, who spend their days under leafy cover and their nights active in the dense jungles. Males rub their wings together to create a mating song to attract females, which adds of the musicality of the rainforest night. Deforestation of the worlds' rainforests threaten all who make their home in the jungle, animals and insects alike, and efforts are ongoing to conserve this play land of some of the worlds most unique species. No book on rainforest insects would be complete without mention of the thousands of beetles, centipedes, millipedes, leaf hoppers and stick insects who blend effortlessly into the landscape of South America -- or the lantern fly, the subject of mysterious legends. The Amazon is home to some of the thickest and most dense of the planet's jungles, and there may be insects in these regions who have not yet been seen by the eyes of man.